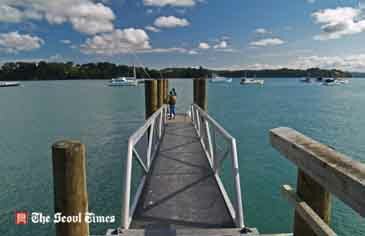 Northland, New Zealand, is often imagined to be the spectacular Bay of Islands, and the historic town of Russell, about three hours north of Auckland. To my surprise I did not have to travel this far from Auckland, the largest city in the north island, to experience beautiful sights. I simply had to follow the highway, an hour north. The journey begins crossing Auckland's Harbour Bridge, where one gets spectacular views of the city, and the ever present sixty storey Sky Tower. Traveling the northern motorway - which will soon be extended – I reach the small coastal town of Orewa, a once typical holiday town for Aucklanders. Elderly cross the streets on scooters and professionals sip oversized lattes. This is no longer the domain of the holiday maker though. Many have settled in this region to escape the density of Auckland. Ascending north I stop at the small historic town of Puhoi. In its Catholic church - St Peter's and Paul's - the Minister, in his distinctive Irish accent, is struggling with the alignment of a data projector. Assisted by Tom, a yachtsman, he says how he needs more height. "I can't use the good book," he chuckles ironically, pointing to a Bible placed neatly on a stand. Outside the 1860s church, Tom, in a salty American drawl, says how he wishes to settle in the region. "I have traveled to many places, delivered yachts for years in the Mediterranean. New Zealand has everything Europe has to offer. It's all within the confines of both islands." The historic village is quiet. Now a day dripper destination, with an historic hotel and gift shops, it was once a remote town accessible only by riverboat. The nearby cemetery gives clues to the first European settlers - Czech people (Bohemians), of Catholic faith. They first came to the region in the 1860s, from the small town of Stod about 100 kilometres from Prague, an escape from political and economic persecution. Supported by the local Maoris - the Ngati Rongo - they built a community by harvesting magnificent Kauri trees. Thousands of trees were floated down the Puhoi River – a river meaning 'slow moving' in Maori. Charcoal was made and sold. Wood was split for housing shingles. With more settlers the town eventually grew into a thriving settlement - a big cry from its original depressing mud flats. The settlers' relationship with the local Maori, including the fascinating story of the enterprising Maori Chief Te Hamara Tauhia, make interesting reading. The magnificence of the Kauri tree can be witnessed at the Parry Kauri Park twenty minutes drive further north - a few minutes south of the town of Warkworth. Huge girthed Kauri trees stand in their elegance. A well constructed boardwalk allows one to walk through a forest reminiscent of early New Zealand. Next to the Parry Kauri Park is the Warkworth and District Museum. One can read of the many uses for Kauri wood, including its gum that was harvested and used for varnish and linoleum. This fostered another interesting European community - the Dalmatians - who established a gum digging community towards the top of the north island in the 1880s. The Museum includes displays of historic shops, a dental surgery, and even a photographic darkroom that has become an exhibit in our digital age. An array of eccentric items can be viewed - a great reason for visiting small Museums reliant on local contributions. A cabinet of curiosities boasts a cow hair ball, a packet of cigarettes from a World War Two Japanese soldier, and a shoe from Scott's polar expedition. Equally fascinating is the account of a whale stranding by a thirteen year old student. It tells of current environmental and Maori ceremonial duties required in the disposal of whale carcasses. A far cry from the days of whaling! Outside the Museum are World War Two huts. Up to ten thousand U.S. soldiers were stationed in the area at the height of the Pacific campaign. One hut shows the graffitied name of a U.S. servicemen and the intriguing story of how he has been recently contacted by the historical society. Balancing images of whales and kauri trees, a short three minute drive finds me at the ruins of the Wilson's Cement Works. Rearing itself like a medieval castle it was founded in 1866 by Nathaniel Wilson. Portland cement was used extensively in New Zealand's growing cities. The ruins are surprising, picturesque and evocative – the lake a great swimming hole for locals in summer. Warkworth – several minutes north is good for a coffee break and shopping. A seven minute coastal drive, eastward, takes me to Snells Beach and Algies Bay, a much underrated destination. There are broad sunny beaches and historic homes. I stay in a cottage at the Bethshan Seaside Cottages Motel. It is a quiet inlet, with a number of well serviced and relaxing cottages. In its grounds is the curious Mullet Point Post office, a cute building dating back to 1877. John, an accountant from Auckland, has just placed a net in the water. "I am surprised I got in here," he says. "What a great place. And it's school holidays." The beach is only metres from the well serviced cabins. John has brought his boat up from Auckland. One can watch the tide rise and fall, enjoy barbecue facilities, or stroll along the beach. 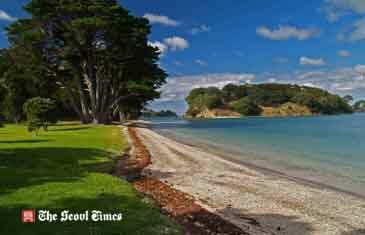 The following day finds me at Scott Point, on the beautiful Mahurangi Harbour. A walk along the serene beach allows me to take in the historic flavour of the Scott homestead. Nestled in a beautiful inlet, under a gorgeous pohutukawa tree, the 1877 Georgian Style homestead is a testament to the areas once burgeoning ship building and timber milling industries. Sue and Mary are fishing at the nearby jetty. Sue tells me how a few weeks before an old church, on a barge, had poetically made its relocation up river. I think of the Peter Carey novel "Oscar and Lucinda." 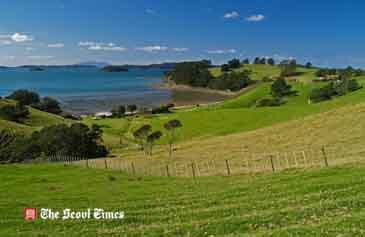 Pete, a retired train driver, is at his 'bach'- a unique kiwi name for a holiday home. "I've always come up here to get rest," he says. "I always feel revitalised for the following week." He recounts train stories and watches his rod for an elusive flounder. The day is rounded off by a short drive to the historic Scandrett Regional Park. One of New Zealand's recently opened parks, it has a long Maori history - Maori coming to catch and dry sharks in the region. The historic Scandrett Farm - Lisadian - was built in 1884. The bay is quiet and one can easily sense what life must have been like in the past when the only access was from the sea. One of the most beautiful moments, and one that has seared itself into my memory, occurs later that afternoon when I sit in the grounds of the old farmhouse. I feel the spirit of the land. I imagine the Maori who fished and established two pas - fortified villages - in the area. I walk through the farm imagining that the family is still there. Feijoa are lying on the ground having just fallen off a tree. This is the best time to eat them. They are delicious. I wonder if I am continuing a garden pastime of the Scandrett family. The tide is low, the rock flats exposed. Imagining the farm at work, cattle being milked, a barge delivering and collecting goods, I marvel at the fact that I am only an hour from Auckland. I have found peace and serenity and much unexpected history. http://www.puhoihistoricalsociety.org.nz/ Website of the Puhoi historical society.